There’s still time to fit in another festival this year, isn’t there? This ‘summer’ has been like an extended autumn anyhow, so it doesn’t really make a difference. Spending the weekend in an industrial estate not far from Liverpool city centre and the docks has become an annual ritual for me, and a must – an event that showcases experimental, trippy, dark, weird and wonderful sounds that have been developed from all parts of the globe is exactly my kind of thing. 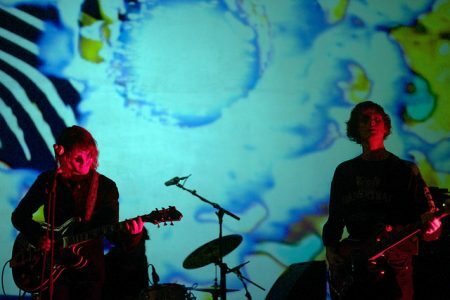 This year’s headliners -The Black Angels – may very well be one of the bands that you think about when you think about psychedelic rock, but the rest of the line-up covers everything from shoe-gaze, krautrock and afro-beat to folk, ambient and electronic. Two days with 4 stages on tight schedules await, as well as chill-out areas, art installations, films and interviews. The very capable festival curators have promised us that – ‘This Festival Will Destroy You’. I’m kind of hoping it will. Duds light up the Camp stage to kick things off on the Friday afternoon as part of the Castle Face Records take-over; the Manchester band draw a large crowd to this, the 2nd largest space, bathed in psychedelic projections with the big screen behind them showing distorted altered images of their live performance. They’re a blend of post-punk and art rock, combining unique beats from the 3 drummers and percussionists, who keep you on your toes and bully you around. Stop-start beats create an awkward amalgamation of sounds that gel in a DIY fashion with the 3, tinny sounding, sporadic guitarists… and occasionally, a trumpet. It’s a thrilling and perfectly executed set from the band, on the day that they release their debut album, ‘Of A Nature or Degree’. ‘Elastic Seal’ is EXTREMELY funky – it’s no surprise that so many had turned up early to see them. Portsmouth trio Is Bliss are first on at the main ‘Furnace’ stage – Verve-like shoe-gaze creates a chilled atmosphere from this band who are at their best during calmer moments, allowing us to take in our surroundings. 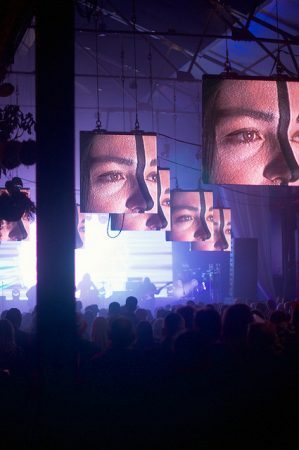 Square screens hang from the ceiling, drawing your gaze towards the band. The bar on the left side has a garden theme, with plants and greenery hanging above and around it, lit by multiple Edison bulbs. Beautiful. Much needed seating has been added here, and around the rest of the site… I guess the organisers have been listening to feedback. There are also more bars, more toilets, and a recycling drinking cup system, which works wonders. But, there’s less choice for food, although the stalls that are here are all superb. The usual two DJ tents are in the street – one for dancing, and one for relaxing on comfy chairs while grabbing a book or a coffee or a kaleidoscope. I saw someone doing Yoga in there, at one point. PZYK PRYZM showcases a trippy Virtual Reality experience; large blobs of what look like mixtures of oil paint float past you as you listen to soothing music. If that’s too much for your fragile mind, you can sit in front of a spinning light with your eyes closed, or stare at your friends faces through what looks like a large, hollowed out maggot… (it’s nicer than I made it sound). Meanwhile, an interviewer sits inside a lit round table, beckoning passers by to literally surround him in a continual conversation about the culture and the scene. Dig Vinyl have a stall here, selling record and band merch, all weekend and at all hours. If you were afraid of missing your favourite band amongst these distractions, there’s an app especially made for the festival; you can select your favourite acts in the schedule and get a 15 minute warning before they go on stage, which proves to be invaluable. There’s a queue that leads out the door in the smallest of the 4 venues – Blade Factory – for Boston’s Magic Shoppe. They carry an understated broodiness amongst the driving, reverb-soaked guitar chords and vocals – “Now I’m here I want to disappear from all of you”. The lead singer’s Manchester t-shirt doesn’t appear to have put off the locals, who savour every moment. He rightfully draws attention to the truly international lineup at this festival that maintains a high quality by casting it’s net to all 4 corners. Their final tune ‘Her Ritual’ is the highlight of a great set. 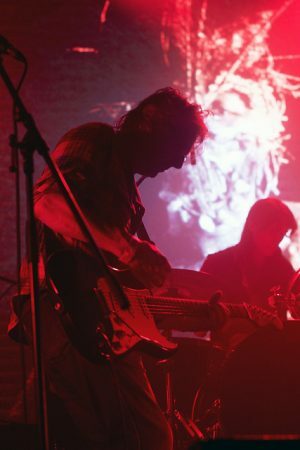 The Telescopes have been creating hypnotic walls of sound for 30 years. Only singer Stephen Laurie remains from the original line-up, but their 9th album was released this year to huge acclaim and they appear as fresh as ever. A blend of The Stooges, Velvet Underground and The Jesus and Mary Chain, they fit in perfectly, here. 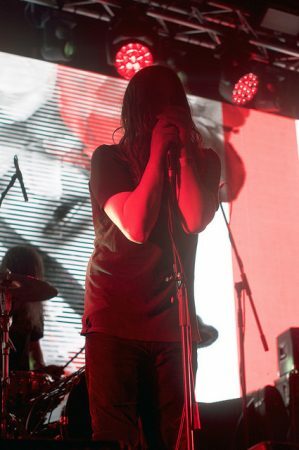 Their recent work proves just as worthy of discovery as their older material, giving The Fall a run for their money and justifying their place on the main stage. They finish with the superb 15+minutes of ‘The Living Things’ from the recent album Hidden Fields. The plodding beat and grinding guitars hold everyone captivated and they leave the stage with the sounds still emanating for some time from their discarded equipment. London quartet Novella impress in Blade through a combination of soothing layered vocals and krautrock beats and synths, with great bass lines completing the euphoric cacophony. 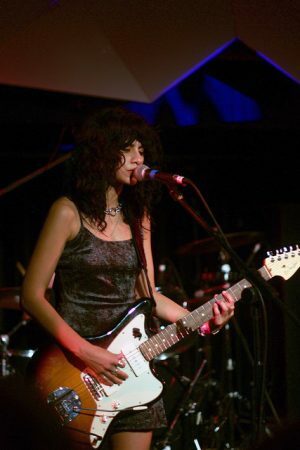 L.A. Witch have been causing quite a stir with the release of their debut album, and could be seen enjoying The Telescopes before entertaining the District stage. They fulfill high expectations, nailing their performance and immersing the crowd in woozy, straight forward psych rock that’s incredibly infectious. Personal favourite ‘Baby in Blue Jeans’ is perfection and they finish to rapturous applause with the popular single ‘Get Lost’. Groundbreaking Swedish band Träd, Gräs Och Stenar (Trees, Grass and Stones), play the Furnace stage under stunning red and white flame-like visuals. They have been going since 1969, pioneering the DIY culture with extended jam sessions that pushed the boundaries of krautrock. ‘I Ljuset Av Din Dag’ (In The Light Of Your Day) is an awe-inspiring way to finish their set, invoking the spirit and vibe of Woodstock. Song Hoy Blues add variety to the congregation and headline the MainStage, but I head to see The KVB in Camp. The UK duo’s minimal electro and guitar combination draws comparisons to Death In Vegas and The Kills. The first few songs lacked umpf, but someone somewhere must have flipped a switch – the bass kicks in and so does the dancing with 4/4 beats that create an 80’s clubbing atmosphere. A version of guitar-heavy ‘Dayzed’ from 2013 album Immaterial Visions leans more towards shoe-gaze, and they finish with a rather unique cover of ‘Sympathy For The Devil’. Things are about to get nasty. GNOD take over in District, menacingly preparing their instruments to inflict full damage. For a while I felt their music has lived by their name – Got No Obvious Direction – and I struggled to enjoy what they were producing until the latest album. I’ve seen them support at gigs a few times and they’ve left me perplexed; repetitive beats and noises failed to maintain interest as they paraded around the stage in bizarre budget costumes, as if performing some sort of religious cult ceremony. ‘Just Say No To The Psycho Right-Wing Capitalist Fascist Industrial Death Machine’ changed all that, connecting with me on a political level as well as containing more musical sustenance. They start tonight by jamming a ferocious beat accompanied by a wall of guitar sound that bubbles with sinister intent, but fails over time to explode into the kind of hedonistic and eye-opening mayhem that is promised. The diminutive singer would generally cut a less threatening figure than the rest of the band were it not for his over-sized Parka that has a huge fur-lined hood, and his incoherent wails and manic gesturing. The violent thrashing of instrument around him would cause ears to bleed if the amps were any more powerful. The last two songs are easier to make out and are much the better for it – ‘Paper Error’ and highlight ‘Bodies For Money’ ignite the mosh-pit, releasing 30 minutes worth of pent-up energy and frustration. Maybe that was the idea all along? “You can keep your ****ing money”. It was certainly an unforgettable performance, for all the right reasons. I finish the night back at Blade where Container is something else altogether. Rhode Island’s Ren Schofield stands on stage behind his Roland MC-909 and some sort of tape deck. He flicks through a collection of scattered white cassettes from the table, steps back, ponders for a while, messes with his laptop, and then triggers some of the most incredible minimal techno beats you’ll ever hear. Interludes of electrical distortion separate the samples for a short while until he selects another tape, and we go again. This ritual has the crowd going absolutely nuts. I’ve seen a number of memorable performances in this room over the last few years, and this one can very well be added to them. Smiles of delight and cheers of appreciation spontaneously follow the introduction of the next loop, building the sweaty and energetic dance floor into hysteria. 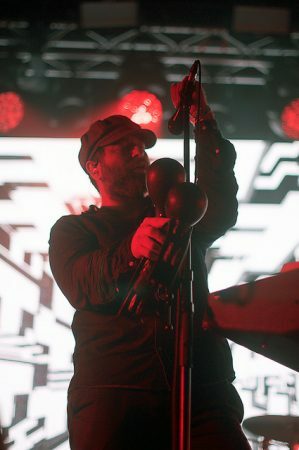 He ends his set but we want more – a dozen people shake his hand and try to stop him from leaving the stage, begging him to drop another tune, but apparently he’s all out of tapes. Saturday, and after a late night and early rise in a noisy hostel, I’m exhausted but ready for more. Tired but happy faces discuss last night as we head zombie-like for Camp. 1.30pm and Dead Vibrations remind us why we’re all here. Only 12 hours ago, I was leaving Blade to get some rest. They’re Scandinavian and only have an EP and single to their name, but the strength of these songs promises much. ‘Drain’ brings about an unavoidable case of chronic goosebumps, and a natural high. “I just let it go…”. ‘Desolate’ is more of the same – uplifting shoe-gaze with strong riffs and infectious drumming – another highlight. Definitely ones to watch. All the way from Argentina, Hurricane Heart Attacks fill the District stage and are really happy about it. From now on, pretty much all of the stages are overflowing and turning up early is essential. Various forms of shoe-gaze seem to have taken over this year, replacing the garage rock and dream pop of 2016. Cutting beats and thrashing guitars support the reverb heavy vocal that occasionally reminds me of Liam Gallagher. The instrumentals impress the most, with outstanding guitar solos and beautifully crafted soundscapes. The sound is perfect. They run us through a full spectrum of emotions and leave after filming the crowds reaction, to savour the moment. 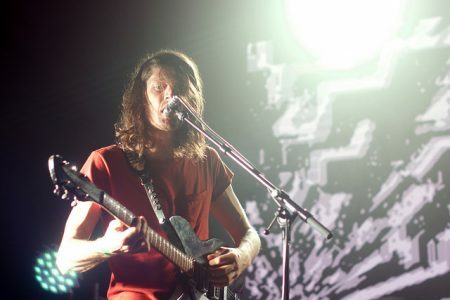 A number of ethereal and trippy acts populate much of the afternoon – Castles, Celestial Bums and Zofff please the colourful tie-die brigade before the evenings chaos, kicking off with Newcastle’s Pigs Pigs Pigs Pigs Pigs Pigs Pigs. Think of them as GNOD-lite. The lead singer is becoming agitated with the sound engineer and his shirt is off before we’ve started. Matt Baty stomps around like a demonically possessed version of Future Island’s Samuel T Herring. The queue outside runs far up the road for this, and those who managed to get inside aren’t disappointed. Wolf People make their 3rd appearance, here, along with special guest Reine Fiske from Dungen, who played last year. Stunning visuals from Inner Strings are the perfect accompaniment for their folk-rock… I keep saying this but it’s true, the crowd are once again very vocal in their support as the band play a superb set. Norwegians Rancho Relaxo combine loud instruments with laid-back vocals and young Dutch math-rock/pop band The Homesick show plenty of potential with clever compositions that remind me of Foals, in places. They look really young, but the last line of their final song gave me something to ponder – “The best part of being young is falling in love with Jesus”… I guess they are the best god-rockers I’ve ever heard? The next 3 bands on the main stage are about to turn an already great experience into stuff of legends. 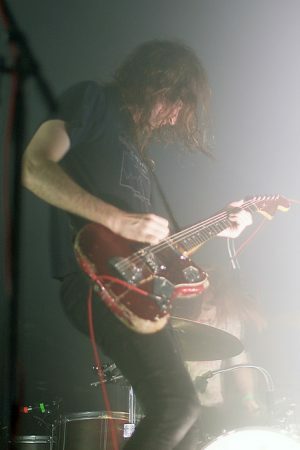 New York’s A Place To Bury Strangers plunge the Furnace into darkness and pump smoke on stage, lit only by brilliant white strobes that visually mimic the eerie nature of their sound. Cold vocals accompany the relentless pounding kick drum and rattling snares with razor sharp guitar riffs and spiky synth sound effects. The best word I can think of to describe this is – menacing. Heads nod while we view, through sinister eyes, the thrilling theatrical performance. The crowd react between songs as though their team has just scored a much needed goal. Skilfully crafted distortion takes us to the edge and the dark lyrics tip us over. “It feels so real, I lost myself today”. It seems to be all over, but following an impressive leap into the crowd, the set ends in the centre of the room whilst being held aloft by exhilarated fans and lit by mobile phones. W.I.T.C.H. (We Intend To Cause Havoc) are something different altogether, and manage to generate the best atmosphere that I’ve seen here, to date. 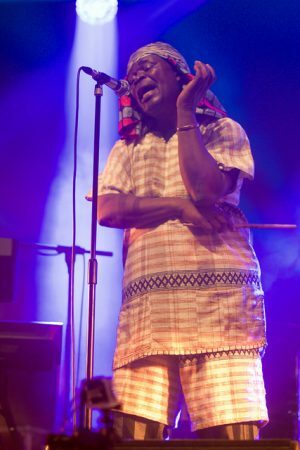 Pioneers of ‘Zamrock’ in the 1970’s, lead singer Emmanuel ‘Jagari’ Chanda has been joined by Jacco Gardner on bass, amongst others (all in large floppy hats), as they delve into the highlights of the bands revived back catalogue. ‘Introduction’ is a great way to start – a song that was written especially just to let you know who they are. Keys, bass, wah-wah lead guitar, rhythm, drums… all are as funky as hell. The whole place is moving, basking in the pure sun-kissed joyful and soulful sound. While not singing, Jagari (which is an Africanisation of Mick Jagger) gets up to all kinds of mischief… miming the start of a 100 meter race, toying with his percussion instrument as if he’s never seen it before, jogging on the spot… he’s mesmerising. A film is being made of his life and footage from today will appear in it. Maybe it should be used for the grand finale? He talks of Zambia’s independence day, October 24th, and how his band were imprisoned on the eve of the actual event, simply for playing their music in public. He wrote ‘October Night’ while in jail, and they play it for us. It is, of course, spectacular. ‘Mashed Potato’ is another highlight, featuring a great guitar solo from Jay Whitefield and keys from Patrick Mwondela. Jagari declares that “this is my home… it feels good to be home again” and he promised to swim back here, if he needed to. Their final song, I wish I had the name, is a superb end to a performance that has been wholeheartedly embraced by the capacity crowd. The bar has been raised high for The Black Angels, and they are equal to the task. Themselves, the creators of Austin Psych Fest, they must know more than well enough what an event like this is all about. This has been a long time coming for many in this country who have waited patiently to see them live. Their 5th album ‘Death Song’ has reinvigorated the fanbase and now seems the perfect time to catch them. They play over a dozen songs, mostly from the superb latest album, and it really doesn’t seem enough – I wish they could just play us everything. Their songs creates a serene and euphoric vibe, swaying from blissful content to thrilled awe. My personal favourite album of theirs is ‘Directions To See A Ghost’ and so ‘You On The Run’ is the highlight, for me – it contains the perfect balance of broodiness with Christian Bland’s growling guitar, along with Alex Maas’s distinctive vocal style and synth sounds. Previous headliners have failed to attract me to the main stage on a Saturday night as they seem to have been chosen due to their mainstream popularity, with a loose psych connection considered to be acceptable. It’s great to see a headliner that has much more credibility in the psych rock community, and I hope the same approach is taken next year. Germans Die Wilde Jagd (The Wild Hunt) play a trance-inducing electro set back in Blade, followed by The Bongolian, from Brighton, whose tongue-in-cheek delivery and cheeky showmanship keeps the ecstatic and still music hungry crowd dancing until the early hours. Moog and bongo’s are an epic combination. Who knew?! Once again, I must applaud the organisers and staff. This festival has a warm personality that is, quite frankly needed to ground you after experiencing the full spectrum of emotions that the eclectic roster of acts puts us through. The result – a hell of a lot of people having a really great time. Did this festival destroy me? Yes, when I realised I’d have to wait another year before we can do this again. Aside from that, I’ve got heavy tinnitus, achy legs, sleep deprivation, and I can’t feel some of my toes. Wandering around, it’s great to see familiar friendly faces as we travel between stages. I know I’ll come away from here having discovered some great new bands that I’d never heard before, and that I’d get to see those that I’d longed to see. If you have an interest in any band or genre featured at this festival, I can strongly recommend that you come along and see what else the psychedelic community has to offer.